Sample excerpts from the�introduction to the chapters. This is not a book about the clever things you can do with a computer. Nor is this book about deep scientific discussion and argument, complex mathematical techniques, simulations or computer technology. In fact, we argue that crowd simulations must be used with extreme caution when applied to major events – particularly if they relate to crowd safety. 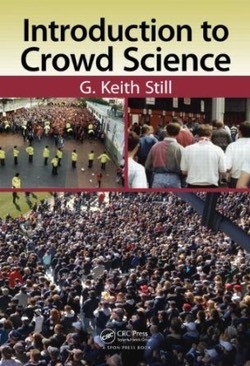 This is a book about how to apply simple, practical techniques to help you understand crowd risks and improve crowd safety. Specifically, this is a book in which we outline how to apply a range of tools and techniques to help you plan for crowds in places of public assembly. We outline case studies where these tools have improved our understanding of event risk analysis and made a significant improvement to crowd safety. We explore the underlying causes that can lead to mass fatalities, and provide the reader with a comprehensive, methodical, systematic and safe approach to crowd risk analysis and safety engineering. The aim of this book is simple: to improve your understanding of crowd risk; to help you plan for, and manage, your crowds safely. One of the more interactive demonstrations we use in the workshops is a series of density experiments using a fixed area. These are important for the delegates to understand both the physical (number of people per square metre) and psychological (how it feels) factors in crowded spaces. The experiments illustrate a common failure in event planning: the temptation to focus on capacity and not on how the spaces are going to be used. We may, for example, have a vast area available for an event but still experience crowd crushing problems if the stage area is badly designed, or entry and exit systems are not suitable arranged, wide enough or have sufficient throughput capacity. Those kinds of problems can occur at pinch points in and around the event site. In this chapter, we shall build up a series of models for both static and dynamic spaces; areas where the crowd is predominantly stationary (static) and where it is predominantly moving (dynamic) to assist the event planner, licensing officer and operations teams to recognise crowd risks. In this chapter, we introduce several modelling techniques for crowd and event risk analysis. Specifically, the DIM-ICE risk model (based on past incidents and accidents to highlight areas you need to focus on in your event planning process), the RAMP analysis (where the crowd dynamic, routes, areas, movement of people over time and profile of the crowd are considered), the Risk and Congestion mapping process (this is a graphical representation of the crowd dynamic) and the decision support analysis (used to assess strategic and tactical options).�These techniques have been developed over a decade of working on many different projects and teaching programmes, and have been applied to crowd and event safety around the world. They are neither theoretical nor academic constructs; they are tried and tested methods. We have applied these techniques to a wide range of events, from small crowds to vast gatherings, and have taught over 6,000 delegates the associated principles and applications for use at their own events. A model is the simple representation of a complex process. Models contain the key elements of a system under study, and most good models begin with the modeller breaking down a complex process into a series of parts.�These parts should be focussed on one or two issues and not be overly complex. Models should be simple to construct, simple to visualise, simple to manipulate and they should communicate the key elements of the system under study to both the modeller and other interested parties. In the context of crowd science, the models we develop are aimed towards understanding crowd risks; they should assist in identifying those risks with the aim of eliminating, reducing, mitigating or managing them. There are four core tools described inthe book: the DIM-ICE risk model, RAMP Analyiss (Routes, Areas, Movement, People/rofile), Risk and�Congestion�Mapping, and the Matrix approach to strategic and tacitcal deciion support (Decision Support Analysis).